Aluminum diamond plate is a popular choice for circumstances where durability and looking good are important. You’ll often see it used for industrial walkways, stairs, ramps, kick plates and other applications where the material will be subjected to the elements and daily wear and tear. Here’s why it’s a great product for your truck bed. 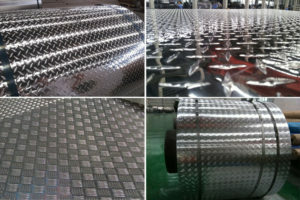 Aluminum Diamond plate is made from hot-rolled Aluminum sheets and comes in a range of thicknesses. Aluminum doesn’t rust like steel, and the sheets are remarkably resilient to wear. That means you don’t have to worry about dirt and damp damaging it. In fact, cleaning and maintaining it is a simple matter of brushing or hosing it down and wiping with a cloth to remove any marks. Looked after, it should last years. The raised pattern on Aluminum diamond plate that gives it its name also results in excellent anti-skid properties. Even when wet it provides a good grip to your feet. The proof of this is in its use for outdoors walkways and ramps, where safety is a particular concern whatever the weather. You can also buy embossed diamond plate, where the pattern is stamped into the Aluminum rather than raised on the surface. This also has a good non-slip effect. Despite its durability, Aluminum diamond plate is a great material to work with. Covering your truck bed with it should be a job you can do yourself with a few tools and some basic DIY skills. The Aluminum plates come pre-cut in a range of different sizes, so it’s just a matter of finding the right one and cutting it down, if necessary (as a rough guide, the length of the sheet should be the length of your truck bed plus twice the height you want to cover, and the width should be the width of your truck bed plus twice the height). Aluminum sheet is easy to cut, drill and bend, so you shouldn’t have any problems in forming it into a surface of the right shape. If you only need to cover the floor, then just allow a small margin on the dimension. Aluminum Diamond plates have a very distinctive appearance due to their raised pattern and the natural shine of the Aluminum. The good news is that this shouldn’t change over time. It’s a great material that combines durability with aesthetic appeal, hence its popular use for truck beds and similar applications. It won’t rust and is resistant to staining, so if you look after it and clean it from time to time it will look just as good in five years time as when you first got it. As well as its other advantages, Aluminum is significantly cheaper than alternatives like steel. In fact, you’ll probably be able to cover your truck bed for a couple of hundred dollars, depending on how large it is. All being well, you won’t need to pay anything for maintenance, either. Check out aluminium-diamond-plate.com large selection of aluminium Diamond Plates and aluminium Sheets. This entry was posted in Aluminium Tread Plate and tagged Aluminum Diamond Plate. Bookmark the permalink.